Which is the best fit for your farm? Your cattle breed must match your climate and farming strategy. But you're not just limited to picking a single breed - for many farmers there are significant advantages (and some disadvantages) to combining the genetic traits of multiple breeds through crossbreeding. In this article I'm going to review purebred, crossbred, and mixed-breed cattle breeding programs to show how each of these choices impacts your cattle business and to help you decide which is the best choice for your farm. Using only purebred cattle that are all sourced from a single breed will create a very homogeneous uniform cattle herd. They will all have the same environmental adaptations. And their body sizes will be very consistent so their nutritional needs will be very uniform. This makes calculating feed and supplement requirements much simpler. The uniformity of purebred cattle can also be a huge asset to your cattle finishing and marketing program. Purebred calves will all be a very consistent size, grow at very similar rates, and finish and be ready to slaughter at roughly the same time and at similar weights and carcass sizes. It is easier to market a uniform beef product. And with all the calves reaching their target slaughter weight at roughly the same time, it is much easier to plan your grazing and schedule your slaughter dates. This uniformity is not found in a mixed breed herd. But the trade-off to only using purebred cattle is that you miss out on some of the traits and adaptations that you get by combining breeds. Combining cattle from multiple breeds can add environmental adaptations to your herd that you just can't get from a single breed. And the extra vigor from cross-breeding can increase weight gains, improve conception rates, and reduce production costs. So before settling on a single breed, it is worthwhile to take a good long hard look at crossbreeding and mixed breed herds to see if they might be a better fit for your beef ranch. There are some key differences between crossbreeding and raising a mixed breeding herd so it's important to take a moment to define them so that we are on the same page. Crossbreeding combines multiple breeds in very tightly controlled ratios. The most obvious example of a crossbreeding program is a terminal cross in which both parents are purebred cattle, but from two distinct breeds, and the calves are always a 50/50 mix of the two breeds. Another variation is to re-bred the 50/50 mix to a third breed, which increases the range of environmental adaptations you introduce into your herd, but also adds yet another degree of complexity to your herd management. The tradeoff of terminal crossbreeding is that in order to maintain perfect breed ratios in your herd you cannot simply rebreed the offspring of these crossbred cattle - you always have to source your replacement breeding stock from purebred cattle herds in order to maintain consistent breed ratios. It's called a terminal cross precisely because the calves produced by the crossbred cattle are never allowed back into the breeding herd. I’ll get into this in greater detail shortly. Mixed breeding is similar to crossbreeding in that it combines multiple breeds, but there is no strict adherence to fixed breed ratios within the herd. Unlike a terminal cross, in a mixed breed program the crossbred heifers are rebred, their offspring are also added to the herd, and so on, so that the overall herd genetics in a mixed breed herd display a huge variety of genetic traits in an ever-changing mishmash of breed ratios. While a mixed breed herd eliminates the herd management complexity of maintaining a true crossbreeding program, it also prevents you from having a consistent ratio of breed genetics in your cattle - genetic ratios are constantly in flux. Mixed breed calves will look very different from one another even if they have identical breed ratios in their ancestry; they will have a random combination of traits that range anywhere along the spectrum between their purebred ancestors. Some will even look identical to one or another of their purebred ancestors despite their mixed breed heritage! The key advantage of a crossbreeding program is that it allows you to combine genetic advantages from multiple beef cattle breeds that have dramatically different environmental adaptations and traits. For example, you could combine the heat tolerance of a tropical breed, like Zebu Cattle with the smaller frame size, lighter (and younger) finishing weight, and cold adaptability of one of the British beef cattle breeds. Many cattle breeders used cross-breeding to combine desirable genetics from a range of breeds to create new brees. Once they got the ratios where they wanted, they "closed the breed" to additional crossbreeding to lock in the ratio. After rebreeding the offspring for enough generations they were able to create a uniform breed of its own while maintaining the genetic traits they were looking for from each of the source breeds. One of the best examples is the Beefmaster Breed, developed in the 1930's using a mix of approximately 25% Hereford, 25% Shorthorn and 50% Brahman cattle in order to create a hardy heat and cold tolerant breed capable of thriving in the harsh South Texas climate. Even subtle changes to a existing breeds are often accomplished using carefully controlled crossbreeding programs. When I was young there was no such thing as Black Simmental cattle. 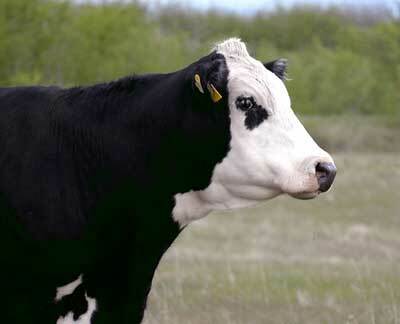 But then someone introduced Black Angus to their Simmental cattle and then subsequently rebred all the offspring back to Simmental for so many generations that their current cattle are again considered genetically purebred Simmental, but with the key difference that they have retained the gene for black hair pigment. Unfortunately there are only two ways to maintain a consistent ratio of breeds in your crossbred offspring. One way, such as in the Beefmaster and the Black Simmental examples above, requires many generations of rebreeding after the right ratio of genetics is introduced to the herd. I don't recommend commercial beef producers try this route - this is best left to specialized cattle breeders because it takes many generations to create a stable mix of traits after the initial crossbreeding period, and since replacement bulls and heifers must all come from within the same herd after the initial crossbreeding episode, it requires extremely complex herd management to avoid the pitfalls of inbreeding. 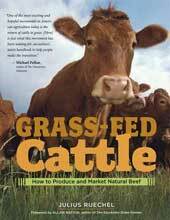 This makes it uneconomic for farmers who simply want to produce beef. The other way is to use a terminal crossbreeding program. The advantage of a terminal crossbreeding program goes far beyond just mixing characteristics from two breeds. Because a terminal crossbreeding program creates offspring with a fixed breed ratio (i.e. 50/50 or 25/25/50), the size, growth rates, and finishing weights of the calves will be extremely consistent and uniform, just like those from a purebred herd, while displaying traits and adaptations from both breeds. Another huge advantage of a terminal crossbreeding program is that the first cross (the initial 50/50 mixed calf) displays hybrid vigor, which is a significant boost in their performance (faster growth rates, higher fertility, etc) compared to purebred or regular mixed-breed calves. The bigger the genetic difference between the parents, the greater the hybrid vigor in the 50/50 crossbred calf. The calf of an Angus cow and a Charolais or Brahman bull will have far more hybrid vigor than a calf produced by breeding an Angus cow to a Galloway bull. (you can learn more about hybrid vigor in this Wikipedia article). Unfortunately hybrid vigor is a one-generation phenomena. That extra vigor does not carry through to the next generation when the initial cross-bred animals are re-bred. One of the most popular uses of terminal crosses to take advantage of hybrid vigor are "Black Baldy" cattle (also known as Black Whiteface cattle), which are a true terminal cross of Hereford Cattle and a solid black cattle breed, most commonly Aberdeen Angus. Their most sought-out use is as replacement heifers (brood stock) in commercial cattle herds. The hybrid vigor expressed by these "black baldy" heifers means that they will have higher fertility rates and be more efficient (cheaper to feed) throughout their lives, which is a significant advantage for commercial beef producers. This makes them a great choice for use as breeding stock, much like investing in more efficient machinery for a factory production line. Black Baldy cows are also noted for their good mothering abilities and their black skin pigment, which makes them more resistant to sunburn on exposed skin (such as noses and udders). The drawback, however, is that black baldy cows can only be created by combining two purebred parents, so a herd of black baldy cows cannot produce its own replacement heifers. The first generation in a terminal crossbreeding program will be very uniform, displaying the perfect 50/50 combination of genetics from the two source breeds. But only a first generation 50/50 mix creates a truly consistent mix. 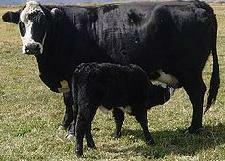 When crossbred offspring are rebred (either to other crossbred cattle or back to a purebred animal), the next generation of calves will display traits that can be anywhere along a sliding scale between the two (or more) purebred extremes, ranging from looking almost completely purebred on either end of the scale to literally ANYWHERE in between. That complicates things. A lot. You either need to rely on other farmers to supply you with replacement heifers or you need to maintain a second separate purebred breeding herd that must produce sufficient heifers to maintain the herd numbers of both your purebred and your cross-bred herd. Either route is more expensive and complicated, which eats up much of the advantage of using a terminal crossbreeding program in the first place.